I took a bus from Napoli, down the coast and out along the coast of the Peninsola Sorrentina, through Sorrento on its northern coast and around to Amalfi on the southern coast. From there it was a short walk to where I stayed in Atrani, right next to Amalfi but with a much nicer atmosphere. 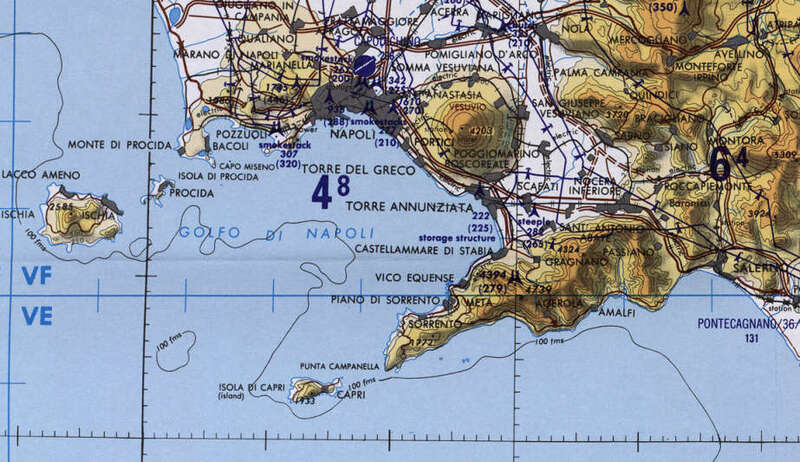 See the below map of the Italian coast around the Golfo di Napoli, with the Peninsola Sorrentina extending out into the Tyrrhenian Sea to its south. 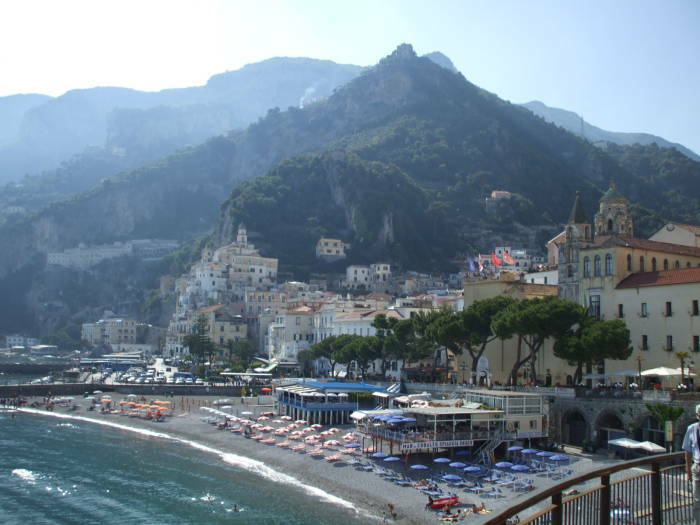 The town of Amalfi is on the south coast of that peninsula. 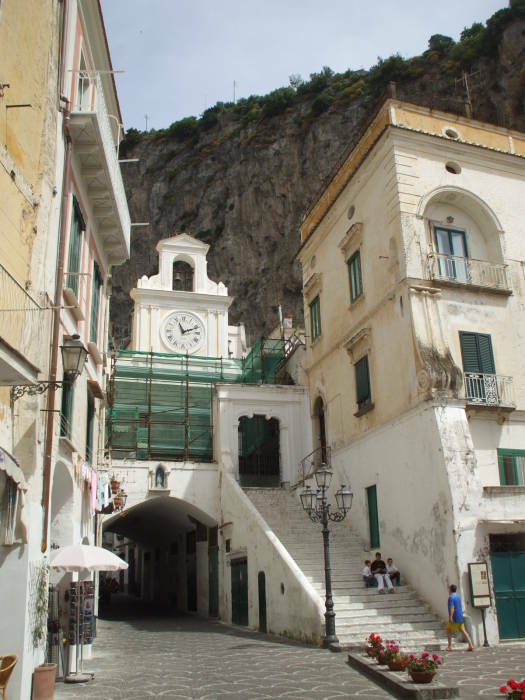 The slightly smaller town of Atrani lies just to its east, a short walk of ten minutes that takes you to a very different and much nicer and more authentic atmosphere. This is rugged territory, notice the closely spaced contour lines and the high peaks (marked in feet, this is a U.S. military map) close to the shore. Also notice how close the 100-fathom line is to the shoreline in places. See the island off the tip of the peninsula? The island is pronounced KAH-pree, while kah-PREE is a type of trousers. Now you can speak of it as if you were a member of the cognescenti, to use yet another Italian word. I bought a bus ticket in Napoli, the capitol of the Campania region. 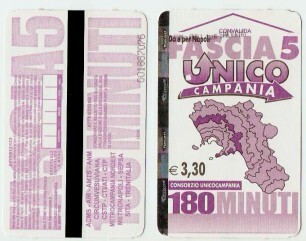 The bus ticket is good for a ride from Napoli to a belt of locations shown in darker purple and taking up to 180 minutes to reach, including parts of the Amalfitani coast. The bus from Napoli goes down the coast below the volcano Vesuvio, then winds slowly along the north shore of the peninsula, across its tip, then back east along the south shore. I took that bus to Amalfi, seen above. The ride took just about an hour and 45 minutes, southeast from Napoli along the coast, west out the north shore of the peninsula and through Sorrento, then crossing to the southern coast and east to Amalfi. Here is the view from out on Amalfi's pier, as if I had arrived by boat. 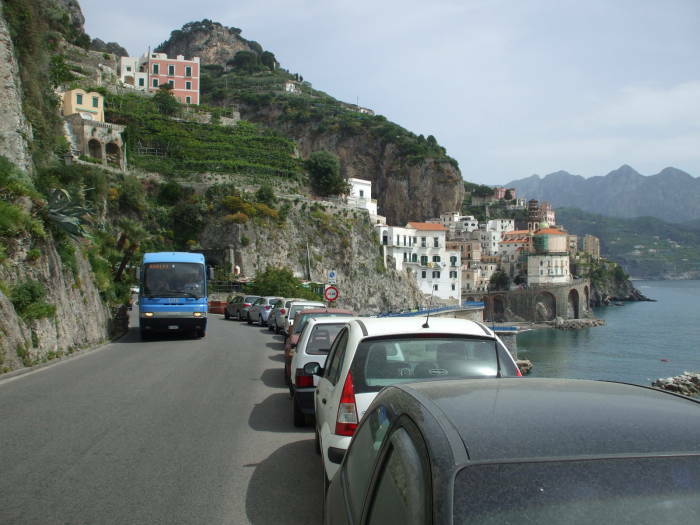 The coast road passes through Amalfi just above the beach and just in front of those buildings. I was going to Atrani. If I been there before, I would have known that I could stay on the bus and ask to get off at the next stop. 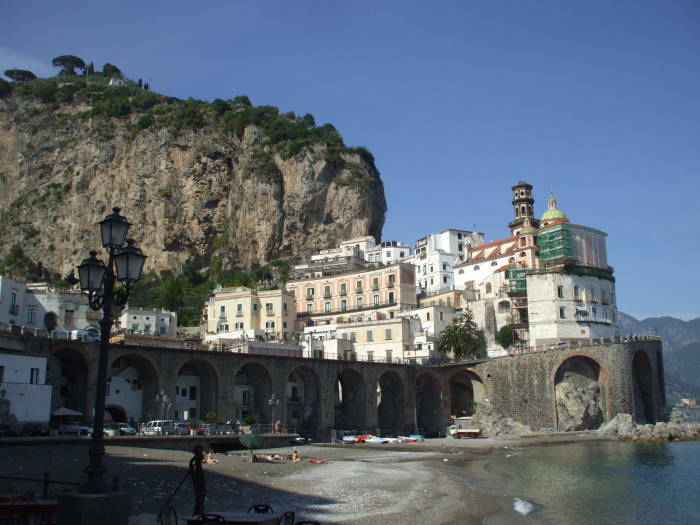 But Atrani is just ten minutes' walk from Amalfi. I knew that much of the Amalfitani coast was almost entirely dedicated to tourism, with constant buses and boats filled with people in each place for just an hour or two before moving on. I wasn't sure, but I had the idea from Lonely Planet and elsewhere that Atrani might be a little less touristic, a place where the local employees of the tourism operations lived. 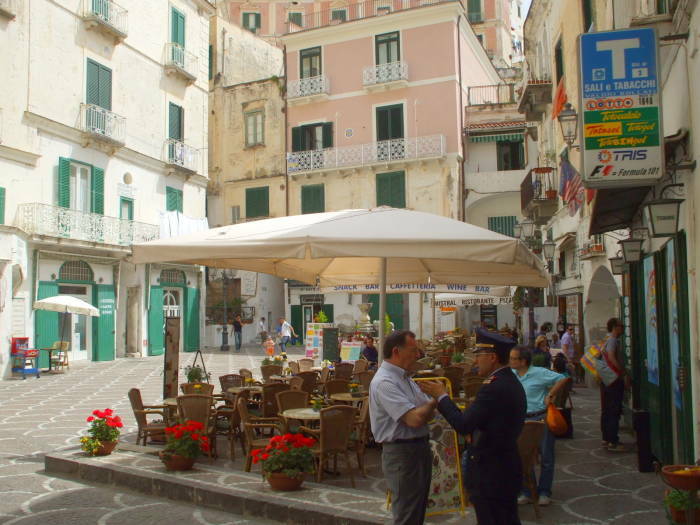 That turned out to be correct — Atrani had, by far, the nicest atmosphere of anywhere I saw along the Amalfi coast. 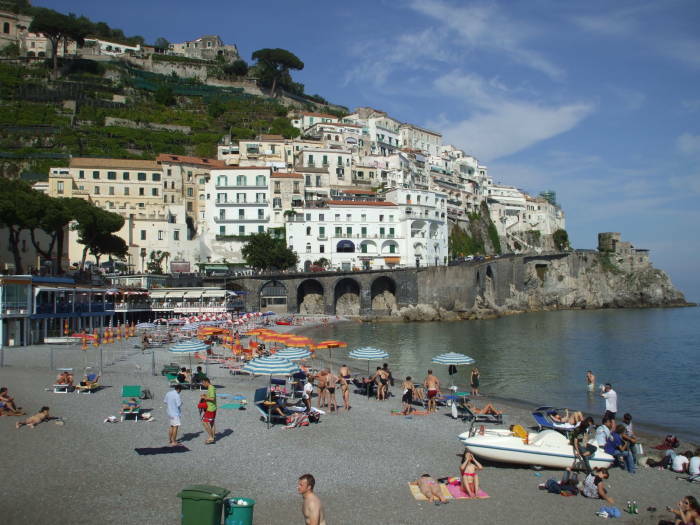 Amalfi has a population of 5,353 and constant arrivals of buses and tour boats. 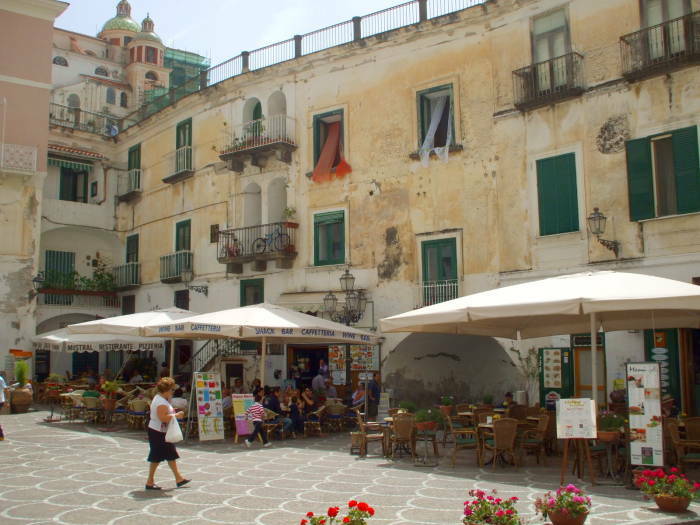 Atrani has a population of just 931. 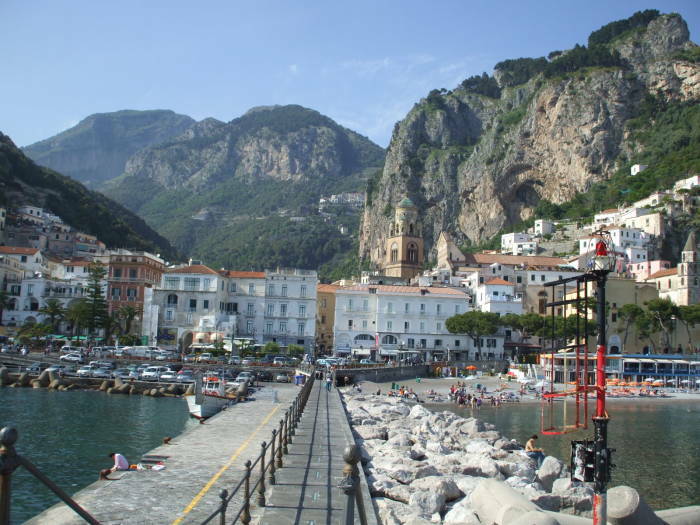 Below is a view looking across the beach of Amalfi from the pier. The coast road continues east over that row of arches and then up and around that point. We need to walk along the coast road and around that point. Above is the view back to Amalfi as we are about to go around the point, next to that small fortified tower that is now a small restaurant. The blue bus is one of those running each direction between Salerno and Sorrento every hour or so. As you can see, the coast road is rather narrow. And this is one of the wider sections! The movie Beat The Devil (1953) was set here, with some scenes featuring the coast road. It starred Humphrey Bogart, Gina Lollobrigida, Robert Morley, Peter Lorre, and many other prominent actors. It was directed by John Huston and co-written by Huston and Truman Capote. They are said to have done the writing in daily installments as it was being filmed. Huston intended it to be a spoof of his The Maltese Falcon in particular and film noir in general. It has to do with the misadventures of a group of swindlers trying to lay claim to a block of uranium deposits in Kenya while they wait for a tramp steamer to take them from Italy to Mombasa. It has been misunderstood or at least mislabeled as a variety of genres including "thriller", "drama," "crime" and "romance", and it would be a rather poor representative of any of them. Bogart disliked the movie, maybe because he lost a lot of his own money funding it. Its copyright was not renewed, so it is in the public domain and can be downloaded for free from archive.org. Anyway, there's Atrani just ahead. Continue down the road. Watch out for the bus! The coast road passes through a short tunnel. A restaurant with a green roof is built on a ledge on the cliff outside that tunnel. But if you look closely here, you can see how things have changed since the days of Bogart. The tunnel is relatively new, and the road used to go down a steel slope where that restaurant is now built. The road then split, roughly along the lines of the two blue railings. 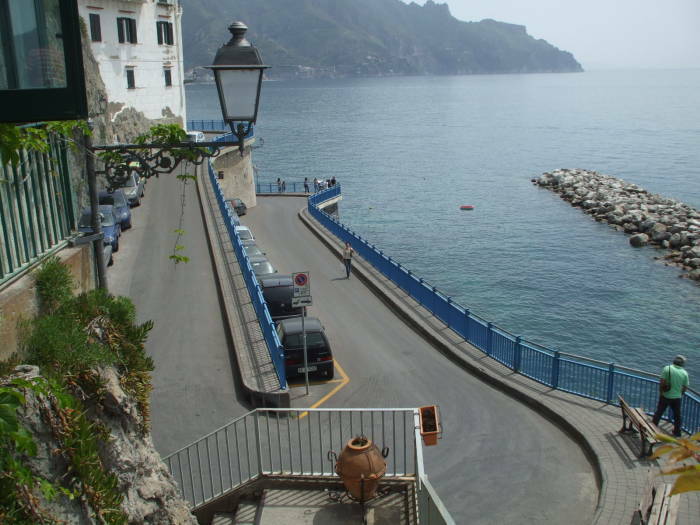 The upper branch continued as the coast road, while the lower branch led down to the beach and into the town of Atrani. We can better see the restaurant on that narrow ledge as we approach the tunnel. 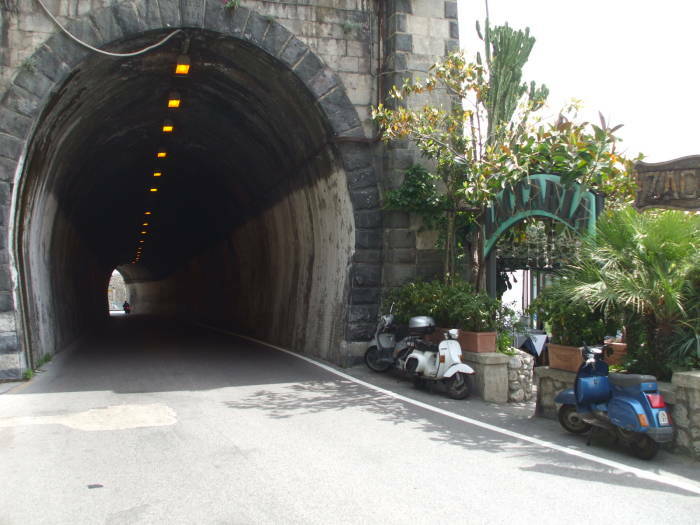 The coast road continues straight ahead through the tunnel, and the entrance to the Zaccaria restaurant is just to the right of the tunnel entrance. 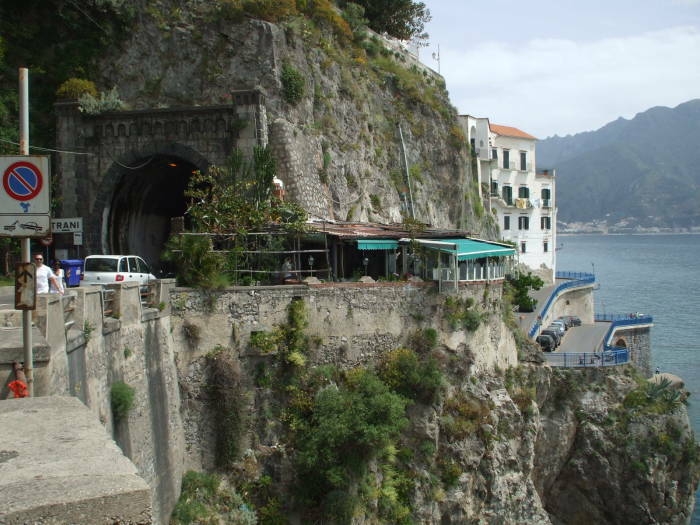 I had read that you could simply get off the bus in Amalfi and walk over to Atrani, but there had been no mention of walking through a one-lane tunnel with no sidewalk. There seemed to be no alternative, so on my first arrival I hurried through that tunnel. 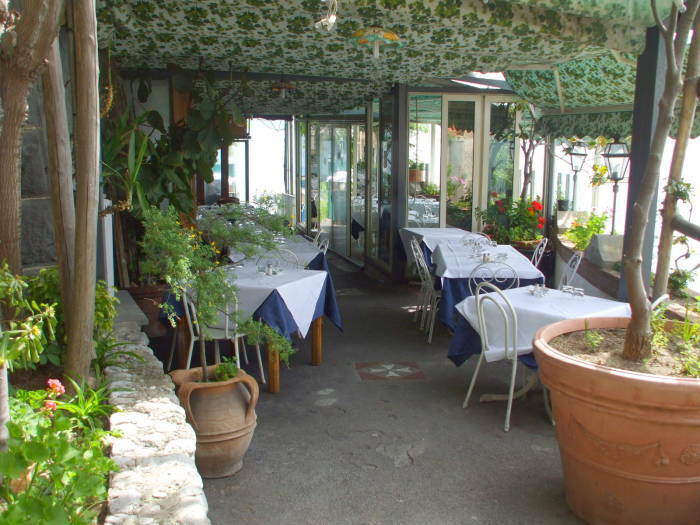 What you are supposed to do is to walk through the Zaccaria restaurant and out its back door. Simply walk right through it, as seen below. Yes, it's a restaurant, but there is a public right of way through it. Go ahead, walk through, everyone does because the restaurant has put its tables on the sidewalk between Atrani and Amalfi. When you get to the door to the kitchen at the back end of the restaurant, just step out through the back door. Then walk down the steps and continue along the road. You will come around the corner and see Atrani ahead of you, as seen below. At this point I was very happy with the results of having done Pimsleur's Italian I course. I was able to ask a guy, "Dove è Piazza Umberto? ", and then handle his response and thank him politely. I had to go down the stairs from the coast road to the beach, because I had walked through the tunnel and I was still up on the coast road. But when you get down to the beach area, you can go through a small tunnel, visible here in the second arch supporting the coast road. 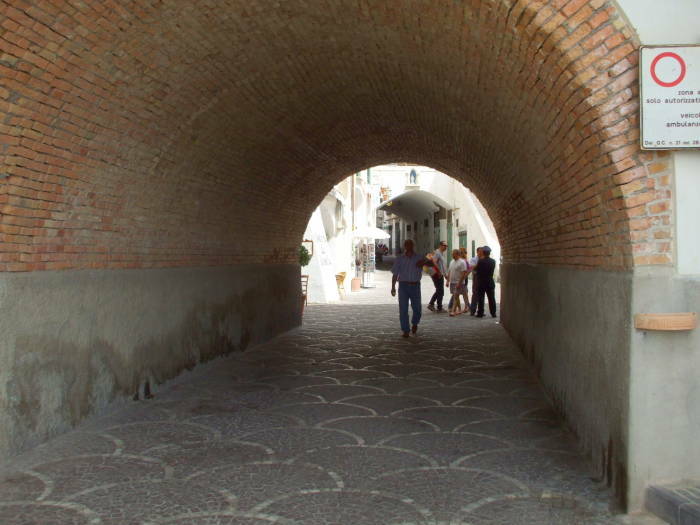 That tunnel leads to Piazza Umberto. No, I didn't get all of that verbatim and literally, but I got the gist of it. 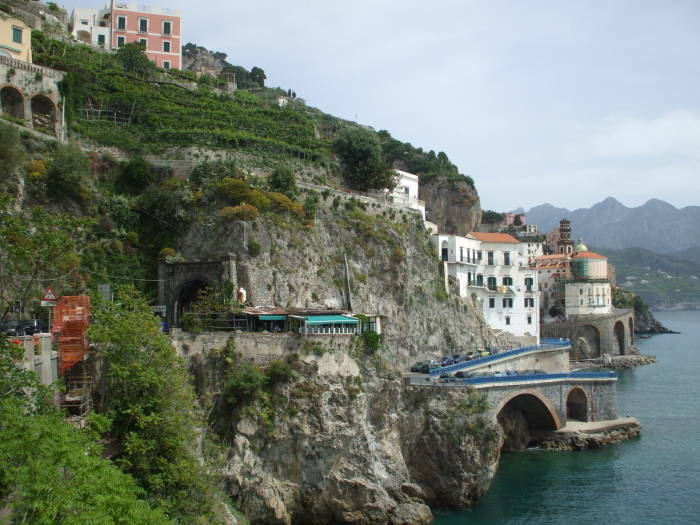 The coast road passes through Atrani on a series of stone arches over ten meters above ground level. 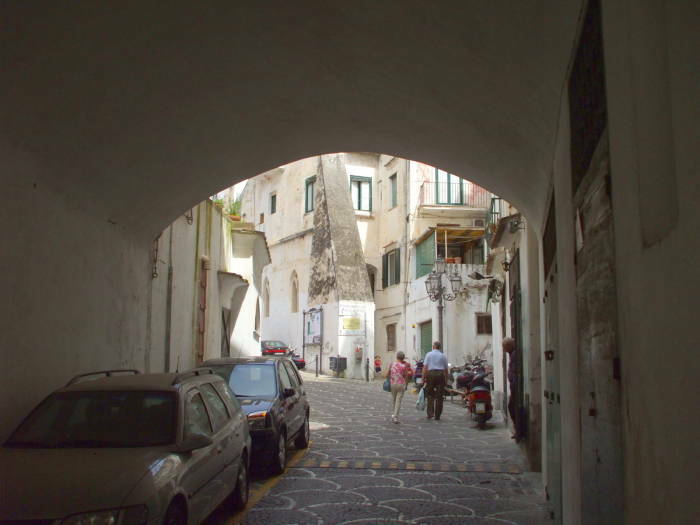 The first three stories of the buildings are visible through those arches, and smaller archways pass through those buildings and into the town. 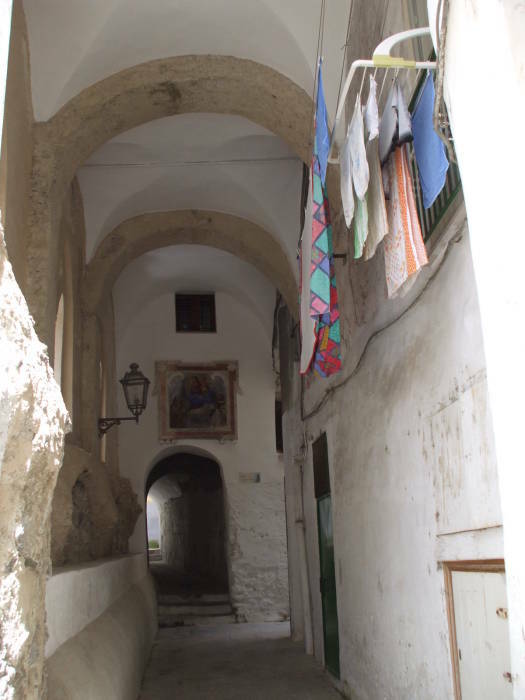 Here we are walking through the largest of those archways through the buildings and into Piazza Umberto, the main square of Atrani. There are some sidewalk cafes, and there is a minor official in an elaborate uniform. Yes, we're still in Italy. 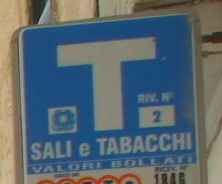 See the white-on-blue "T" sign for a tabacchi, a shop where you can buy things like bus tickets. A tabacchi is to Italy as a tabac is to France. A sign at one of those green doors across the piazza directed me on up the street. Continuing across the piazza, here's a look back at those cafes. I will be back here many times. 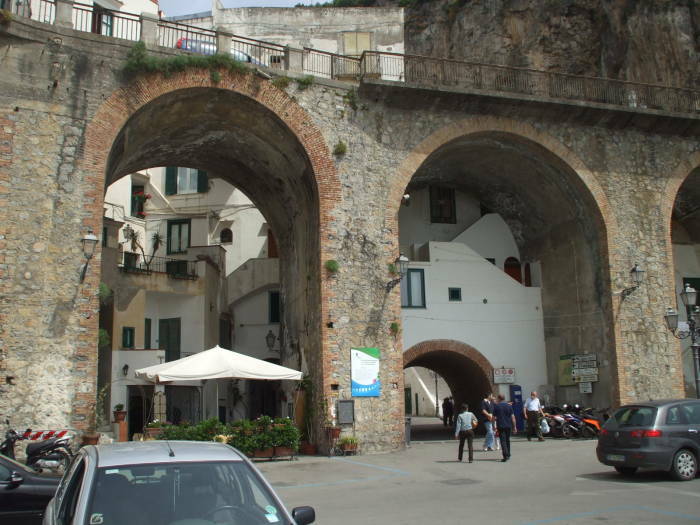 The directions to a'Scalinatella led me on back into Atrani along the only vehicular passage and through another arch. Once through this arch I will continue up the right side of the lane ahead and then go into a narrow parallel passageway. Here is that passageway. 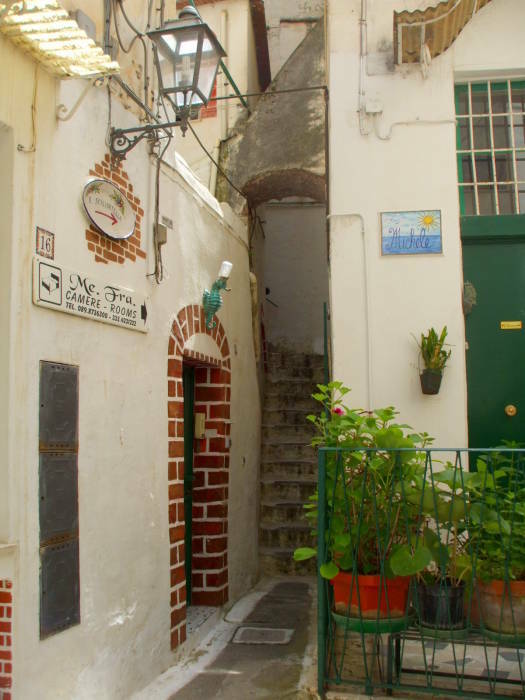 Many of the back "streets" of Atrani and other Amalfi Coast towns are narrow passageways like this, some of them completely enclosed and passing through buildings. Turn to the right at the end of that dark tunnel and go up a short flight of stairs The staircases branch — turn to the right and go up that narrow curving little staircase. Yes, a'Scalinatella seems to be a very appropriate name! Hostel a'Scalinatella was a great place to stay! Filippo, the manager, really made me feel at home. The rooms are cool, dark, quiet, and restful. I don't know if they are really tunneled back into the cliff faces, but it sure seemed that way. Time to get settled in, then go back to Piazza Umberto for a great lunch at one of the cafes. 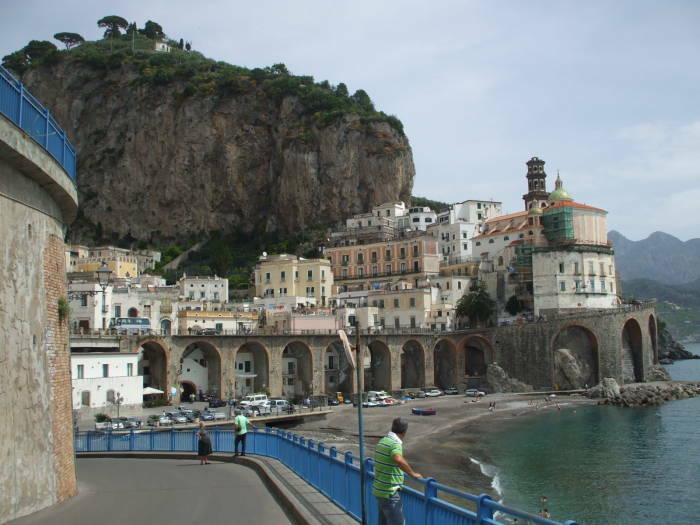 Then let's go back to Amalfi for some tourism.